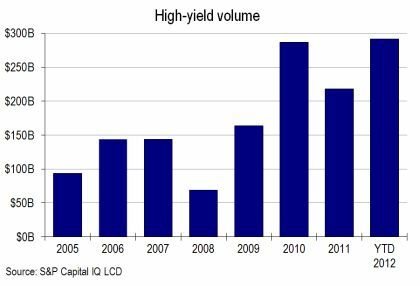 Supply in the primary U.S. high-yield market set a calendar-year record this week when it hit $291.7 billion, according to LCD, a division of S&P Capital IQ. That surpasses the previous high of $287 billion, from 2010, and there is still plenty of room to run before year-end. Breaking the record appeared an eventuality given the frenetic pace of issuance over the past three months, but recall that high-yield supply at midyear was actually 4% lower than the comparable period a year ago. Through the end of this week it is now 56% higher year-over-year and 34% more than 2011’s full-year tally, itself the second-largest annual total. Indeed, since midyear, volume has surged by roughly $140 billion, easily the most for any four-month span. That includes a monthly record of $46.8 billion in September followed by $41.8 billion thus far in October.